What are DLL Files, and How Do They Work? You might have experience the situation where you came across DLL files which do not work with given software due to some lack of .dll files. Once you get this information you start looking for the solution on the net to get that DLL file, place it in correct folds and get the software running. And that’s it – problem solved about DLL files. Yet, it should be interesting to know more about these files. They look important, as their absence does not allow a program to run, so what are they and how they work? Let’s know about it. DLL stands for “Dynamic-Link Library”, and it is Microsoft execution of the shared library concept in the Microsoft Windows and OS/2 operating systems. They are equally important as EXEs, but given different name for clarity in the linking process. However, DLL file cannot be implemented directly and therefore tools like rundll.exe and rundll32.exe is required. DLL files are the ways for developer to use shared code and data, allowing them to upgrade software functionalities without the required of re-link or re-compile. In simple word DLL file store the code and data that is used by various different software. 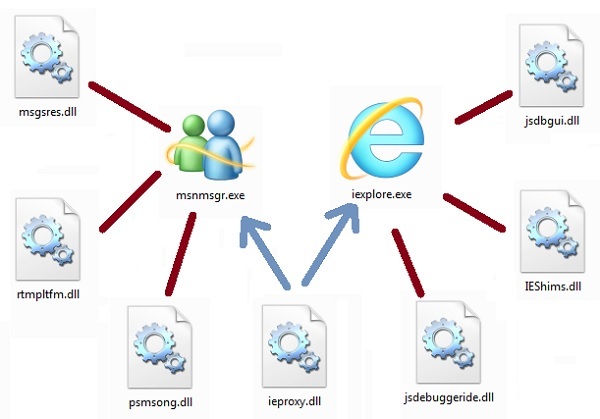 A single DLL files can be used by different software, if they supposed to need it, eradicating the need for several copies of the same information. How do DLL files work? Visualize two different files – “example.exe,” a common executable file, and “library.dll,” a DLL file that is by that executable. How these both files are connected by the operating system when “example.exe” runs? After that the loader code looks for “library.dll” and if it locates it, the file gets loaded. Inside this DLL files, there is another list known as “export list”, which joins particular addresses to each of the function inside the DLL file. From this point of time, when “example.exe” requires to call a functions from “library.dll.” it simply uses that address. When any software lacks a DLL file, the normal approach is to search that file online and store it in correct folder in our hard drive and the software will work fine, but as I earlier mentioned above that various software might require that file, so it is better to put in where they all can get it. So, the “System32″ folder (C:\Windows\System32). x64 users should also copy the DLL file to “C:\Windows\SysWOW64″ and both these operation required Administrator privileges to perform. However, this solution is not recommended by everyone as it may bring some risk like virus infection, outdated DLLs and so on. From my own experience I never had problems with DLL files as I usually fix the dll or registry errors by using tool like DLL Repair Tool, instead of downloading DLL files from other sites as it may be risky. Therefore you must make use of DLL repair tool and get rid of dll or any other registry errors. This tool is particularly designed for the normal computer users and one can easily use it and make their computer error free. How to fix registry windows 8.1?